The UN children’s rights body has raised the alarm over seven children injured since Kiev intensified its military operation in the east of Ukraine a month ago, as residential areas have increasingly come under fire. The seven children UNICEF talks about were not looking for trouble when they received their gunshot or shrapnel wounds. The UN Children's Fund gives a couple of examples of what can happen to a child in Ukraine, while the military operation is in full swing there. 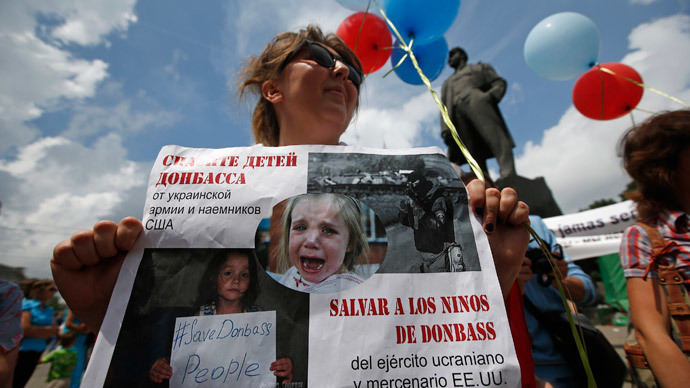 Parents in Donetsk, the city at the forefront of the anti-government movement in East Ukraine, rallied on Sunday demanding that their children be protected from Kiev’s assault. 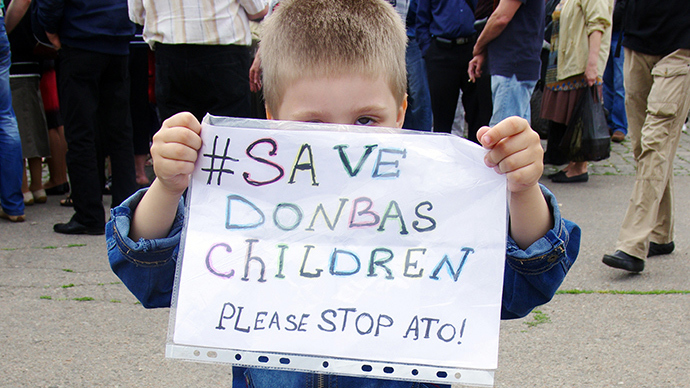 Their posters read "Save Donbass Сhildren.” An online campaign under the same name has also been initiated via social networks. Almost half of the children in Donetsk “have witnessed violence or a horrible event,” according to a UNICEF estimate. Toddlers living in a Donetsk orphanage for kids with HIV/Aids are definitely among them. “The problem is that a jet flew over, dropped bombs, and now all the children when they go out, they look at the sky asking, ‘Who will come? Will they shoot or not?’” Viktor Goncharo, the orphanage’s director, told RT’s Paula Slier, who visited the facility. The orphanage is close to the airport where some of the fiercest fighting in the Ukrainian conflict has taken place. 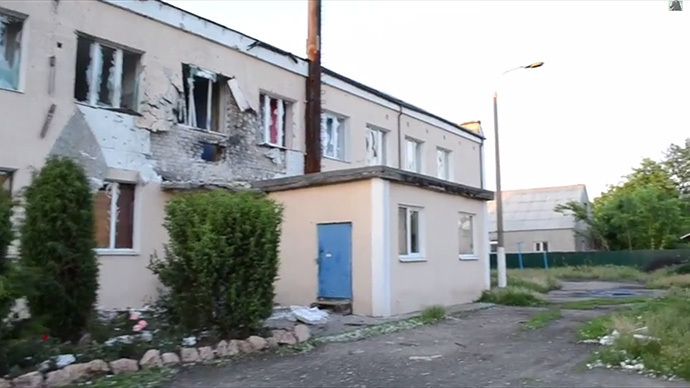 Another orphanage in eastern Ukraine’s Slavyansk was severely damaged by artillery fire on Sunday. 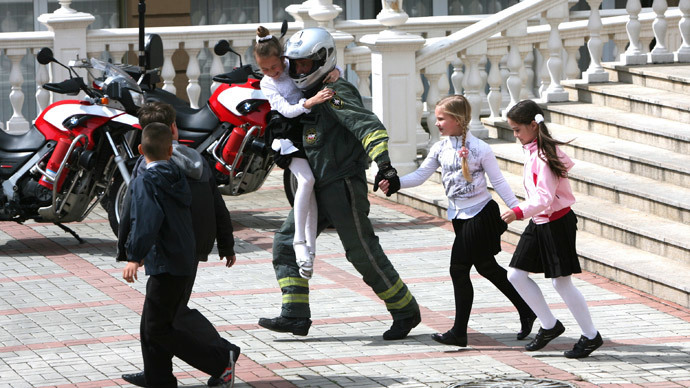 Fortunately, all of the children were evacuated from the building following an earlier, less destructive, attack. 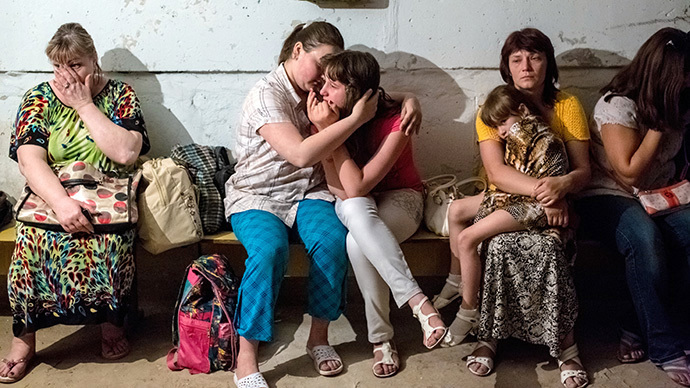 Around a thousand orphans find themselves in the war zone in eastern Ukraine, according to Pavel Astakhov, Russia’s ombudsman for children’s rights. "Russian children’s facilities are ready to take and accommodate all of the Ukrainian orphans,” Astakhov said, adding that Russia has already helped evacuate 830 children from the conflict zone in Ukraine and sent them to summer camps in Crimea. Worries over fate of the children are now part of Russia’s draft resolution on Ukraine, according to Ambassador to the UN Vitaly Churkin. A bus carrying 38 refugees from Slavyansk, mostly women and children, including toddlers, was stopped and seized at a border checkpoint by Ukrainian guards last Friday. Those fleeing the violence in Ukraine eventually managed to cross into Russia on foot. 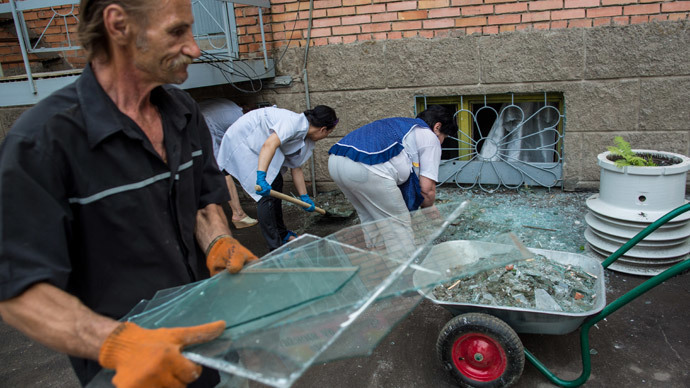 UNICEF said it was deeply concerned “by the recent escalation of violence in Ukraine” and its “huge negative impact on children.” The organization has called for an immediate end to the violence and has urged "all groups involved to protect children".